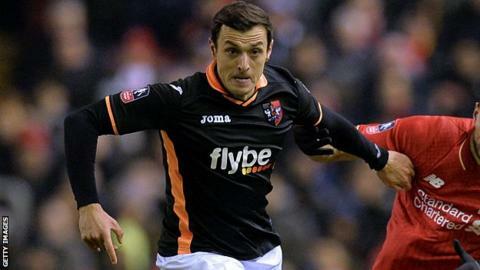 Exeter City forward Alex Nicholls says the squad are working as hard as they can to end their recent poor run. Exeter lost 4-1 at home to Oxford on Tuesday, their worst defeat at St James Park since October 2011 and their third loss in a four-game winless streak. "It's difficult to put your finger on things at the moment, things are bit of a mess," Nicholls told BBC Sport. "We're working our hardest to try to put things right, we all just need to be pulling in the right direction." The losses come just a few weeks after a three-game winning run in League Two had left the club four points off the play-off places. "We're stuck in a bit of a rut over the last two weeks, but we don't feel like a lot has actually changed," added the former Northampton Town player. "It's a time where we need to stand up and be counted, because there's only us in the dressing room that are going to get us out of it. "We just need to keep the positive turn on things and try to improve things game after game." Exeter's gap to the play-off places is now eight points with 14 games to go and Nicholls believes that, while it will be difficult to make the play-offs, it will not be impossible. "We're going to have to turn things around quickly if we're going to achieve something this season," he said. "I think everybody in the dressing room still believes we can do it, I know it's going to be tough, but we have to believe that we don't want the season to peter out and the mindset of the group is that. "We want to put some performances together, get some wins and get back really in touch with the play-offs."